In this collection of passionately argued essays, the internationally acclaimed poet and critic Wai-lim Yip calls Western scholarship to account for its treacherous representation of non-Western literature. Yip moves from Plato to Hans-Georg Gadamer, from Chuang-tzu to Mao Tse-tung, from John Donne to Robert Creeley, as he attempts to create a double consciousness that includes the state of mind of the original author and the expressive potentials of the target language. He aims, first, to expose the types of distortions that have occurred in the process of translation from one language to another and, second, to propose guidelines that will prevent this kind of linguistic violence in the future. Wai-lim Yip is Professor of Chinese and Comparative Literature at the University of California, San Diego. 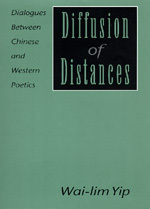 He has written more than thirty books in English and Chinese, including Chinese Poetry: Major Modes and Genres (California, 1976).